WDA has developed a unique way to help you meet people where they are and know where the discipleship process is going. 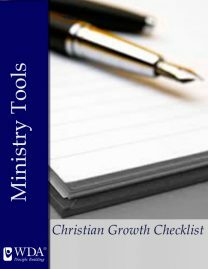 The Christian Growth Checklist provides a tool to identify where a person is spiritually and emotionally. It lets people have a starting point in thinking about what they should learn, what areas of their growth might need to be improved. Many people find that as they grow in their faith, life happens! I have the opportunity to learn and grow but I don’t have as much time to commit as I desire to that particular area. Evangelism might be a good example. Your church might be offering a class in evangelism and how to share your testimony. Yet the week that you were to do that task you miss and never get that one skill down. The Christian Growth Checklist would help you remember that. You would be able to go back and learn how to share you story. The checklist isn’t a tool for spiritual arrogance or a method to make us feel bad about things we haven’t applied. It is a map that shows the places we have journeyed on our spiritual walk and gives us ideas where we can go next. The checklist isn’t a way for me to look at my friend and compare grades like we might have on a spelling test in elementary school. This works well when you have a Life Coach who helps you understand and works with you make a plan and create situations to learn together. We all know the Christian life is a long walk toward being more like Jesus. Eugene Peterson wrote a book called “A long obedience in the same direction.” I like that idea. We are learning to grow in obedience to all the things Jesus wants for us today. Tomorrow I continue to learn and then the day following. The Christian Growth Checklist helps me take the first steps by knowing where I have gone and looking toward next steps. 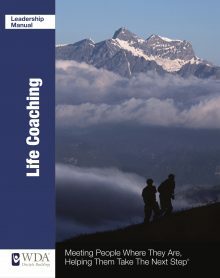 The Christian Growth Checklist is available as part of our Life Coaching Manual and also available as a download at the WDA Store.